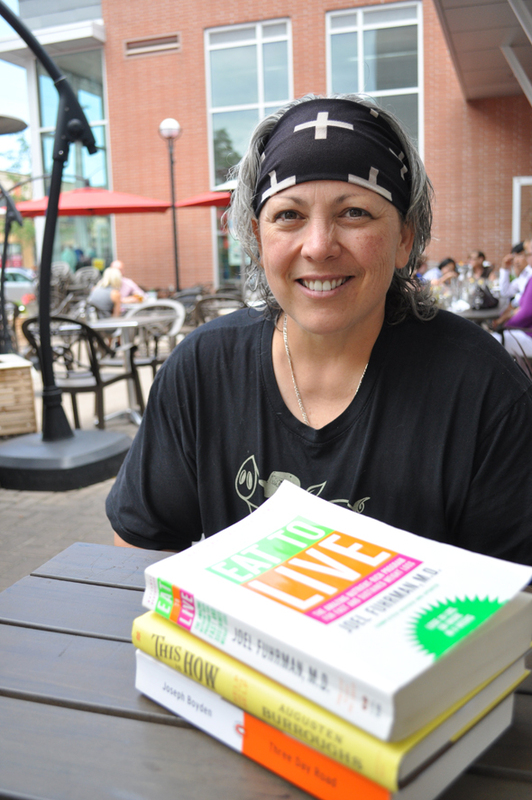 Westfest founder Elaina Martin shares a book that changed her life for the better. Photo by Adam Feibel. Elaina Martin lost 100 pounds in 10 months because of one book. Not surprisingly, Eat to Live by Dr. Joel Fuhrman isn’t the kind that will sit on her shelf after one read. Martin, who founded Westfest over a decade ago, first read the book 10 months ago and is giving it a second go this summer, with two others in rotation and a whole lot more lined up. “This is a very important and powerful book,” says Martin. In the book, Dr. Fuhrman coins the term “nutritarian diet” as part of an effort to help people manage their pain using food rather than traditional medicine. Martin’s osteoarthritis in her hip led her to the book, and the book led her to drop a third of her weight in less than a year. Also in current rotation is Three Day Road by Canadian author, Joseph Boyden, another crucial book for her own education. “It’s a very important book on indigenous Canadian history, but also in contemporary days,” she says. The novel tells the story of two young Cree men in the First World War. Boyden draws from true stories from his family history, including those of his grandfather and uncle who served in the war, and forms a narrative that’s remarkable for its “historically accurate and factual storytelling,” says Martin. While the last Boyden novel she read, The Orenda, only took about three days to read, Three Day Road has taken much longer. To compensate for that, the third on the list is a fun one. This Is How by Augusten Burroughs, with its lengthy and kooky subtitle, compiles a number of quasi-satirical how-to chapters such as “How to Ride an Elevator” and “How to be a Good Mental Patient.” They’re everyday anecdotes that just about anyone could relate to. Westfest Lit has always been included in the festival because of Martin’s deep appreciation and respect for the literary world.